I came across this picture some time ago. It shows Schools class "Repton", somewhat modified for foreign service, although the setting appears to be British. Can anyone provide the "Why", "When" and "Where"? The changes certainly lend it the look of a British-built engine in Colonial use. 926, Repton, is owned by the North Yorkshire Moors Railway. It was completed in May 1934 and entered service on the Bournemouth route, with some time operating between Waterloo and Portsmouth before that line was electrified. It was one of the last of the class to be overhauled by British Railways in 1960, so was considered a good choice for preservation. 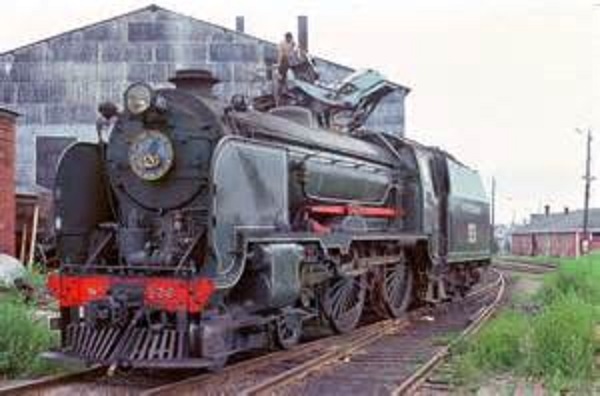 In December 1962 the engine was withdrawn from service, and in 1966 it was purchased and overhauled at Eastleigh, before moving to the USA. It was donated by the purchaser to Steamtown, USA in Vermont, USA. Steamtown loaned the engine to the Cape Breton Steam Railway in Canada, where it operated a regular passenger service. In 1989 it was sold again, and returned to the UK to the NYMR, where it was again overhauled and found to be in good condition. Currently undergoing overhaul. 30926 has also operated on the mainline between Whitby and Grosmont with occasional visits to Battersby. So the photo is t either at Steamtown USA or when running on Cape Breton Steam Railway in Canada. Thanks for settling that, Ian. I'm sure you're right about the picture having been taken on the far side of the Atlantic; after a more careful look, the track is flat bottomed rail with close sleeper spacing. I was initially fooled by the brick structures in the background.